Techie who came first came to India in 1994, speaks Tamil, Greek, Latin, Hebrew. BENGALURU: Foreigners have often shown interest in Sanskrit, which is considered the mother of many languages. Here’s a French national who has enrolled at the Karnataka Sanskrit University to learn the ancient language and master it. Forty-eight year old Nicholas Reimen, who holds a PhD in Computer Science has even sold his consultancy company in France and rented out a flat in Chamrajpet in Bengaluru to learn Sanskrit. He wants to learn ancient scripts like Vedas, Upanishads, the Bhagavad Gita and epics originally written in Sanskrit. Nicholas, who completed his PhD in computer science in 1992, chose a career in the same field. During his work in Malaysia, he made some Tamil friends and he visited India in 1994 as a tourist. As a part of his tour, Nicholas visited Mahabalipuram, Chidambaram, Trichy, Kanchipuram and Tiruchendur and was attracted to Indian culture. In 1995, he visited Bengaluru to complete his thesis on the development of the Indian software industry and his interest in the Indian language Sanskrit grew even more during his stay. Nicholas was always interested in languages from his youth as his father was a linguist who taught Indo-European languages. His mother was a sociologist who still teaches American Sociology. Nicholas says this ignited the fire in him to learn ancient languages and study the relationship between languages. Speaking to DC, Mr Nicholas said, "I was always interested in ancient languages like Greek, Latin and Hebrew. What Sanskrit is to India, these languages are to Europe. My interest in ancient languages led me to want to understand the cultural and religious traditions." He went on, “I always wanted to learn Sanskrit but did not get the right opportunity. But early this year I decided to learn the language full-time. One cannot learn something bigger in isolation. I sold the consultancy company I owned and enrolled myself in the Karnataka Sanskrit University.” Nicholas says he was married for 20 years but ‘split’ in 2012 and does not have children. Questioned on his future plans after mastering Sanskrit, Mr Nicholas said, "I do not plan ahead to that extent. I have saved enough money for the future. I do not know where learning Sanskrit will lead me." 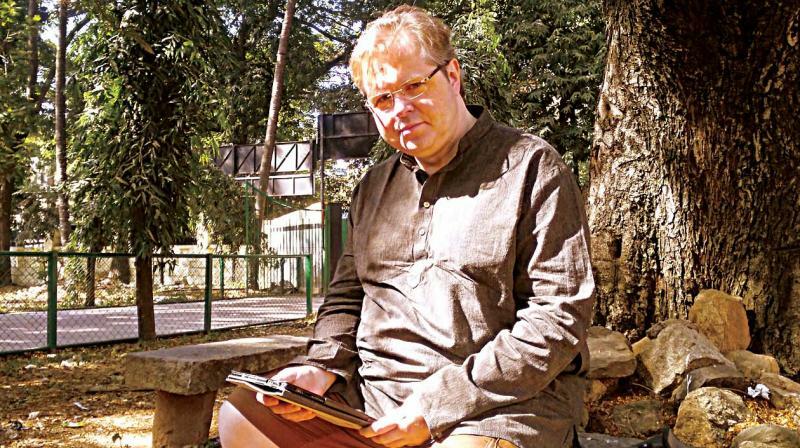 Prof Veeranarayan Pandurangi, Director, Academics, at Karnataka Sanskrit University said, "Nicholas is enrolled under the one-year certificate course where he will be taught Sanskrit from the basics." Observing that he is learning the ancient language very quickly, Prof Veeranarayan said, "Nicholas, who hails from a family of linguists, has already read philosophical works written in Greek. He wants to learn Sanskrit now so that he can read Indian philosophies written in that language."